Need a break from cooking, shopping, and wrapping gifts? 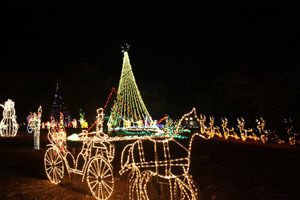 Head toward San Marcos, Texas for an evening visit to Santa’s Ranch, one of the most spectacular Christmas light parks in central Texas. Santa's Ranch Christmas Light Park. You’ll drive through nearly a mile filled with holiday scenes illuminated by more than 1.3 million lights. A 50-foot Christmas tree greets guests at the entrance. Lights twinkle in 100 displays and animations with trains such as Eskimo and sled dogs, carousel, space shuttle, village scene, and a 60- foot long Noah’s ark. Several crosses and Biblical scenes keep the Christmas spirit strong. Favorite fantasies include the drive-thru tunnels. The awesome blue-light tunnel is a shimmering “river” filled with 800 feet of twinkling lights. Once again Frank and Melanie Bass invite families to drive through their holiday park, located on 12 acres of wooded rolling hills. Many visitors return each year to see what has been added. If you’re handy with a camera, there are lovely scenes around every turn, but you must stay in your car during the leisurely drive. Although other Christmas displays and parks in the Hill Country have closed, Santa’s Ranch Christmas Light Park has been successful in providing a wonderful holiday treat for families and friends to share. And recent mild weather is perfect for an outing like this. From Austin take I35 south, exit 199, and stay on the access road for about a mile. Santa's Ranch is open every night until January 3, 2015 from 6-10 p.m. Sunday-Thursday and 6-11 p.m. Friday and Saturday. Use all the seatbelts in your car (in other words, fill it with people), since entry is $28 per vehicle; $56 buys an unlimited season pass. Check the website for coupons. For information call 830-743-1293.